One of the MOST DESIRABLE areas in Destin. Relax and enjoy the many amenities of Sandpiper Cove on its beautifully landscaped 43 acres. The 1100 feet of private beach with its powdered white sand and emerald waters on the Gulf of Mexico. The 5 swimming pools and 3 hot tubs. The 6 tennis courts. The par 3 golf course which is free to play for guests. Boat launching ramp and docking for boats and jet skis. Enjoy the four star restaurant Louisiana Lagniappe and the Rick’s beach side snack shack and bar. Sandpiper Cove a gated resort located in the heart of Destin near excellent restaurants, shopping malls, and amusement parks. 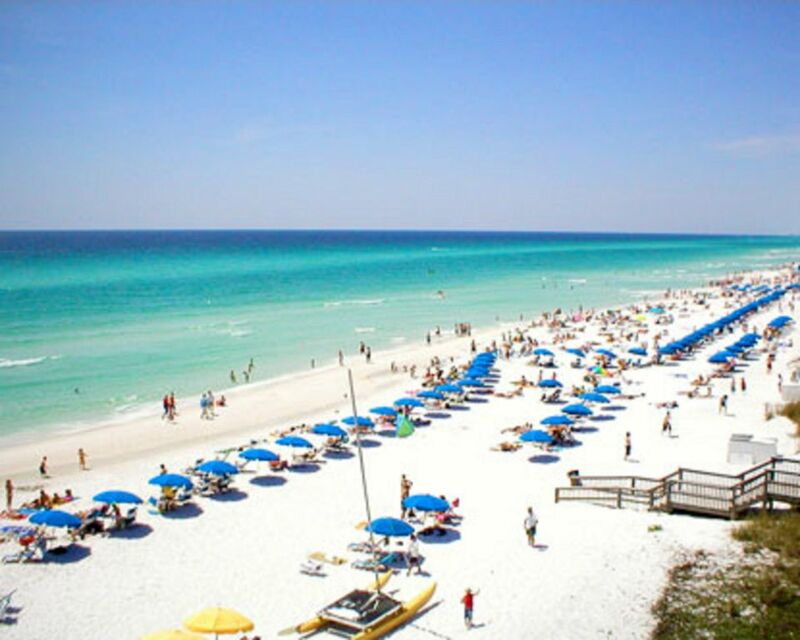 the Destin Harbor which offers pontoon boat and jet-ski rentals, dolphin and sunset cruises, deep-sea fishing trips, scuba and snorkeling trips, as well as many other family activities. Relax in this luxurious 3 bedroom 2 bath condo located across the street from the beach with a large covered private patio with Bar B Q grill and spacious backyard. This well decorated condo has flat screen HDTVs, DVD and free internet, a king size bed in the master bedroom, a queen size bed in the 2nd bedroom, two twin beds in the 3rd bedroom and a queen size pull out sofa bed. The master bathroom is also very spacious and is private to the master bedroom; the guest bedrooms share a connected bathroom. We have been to other beach resort areas but when we came to Destin for the first time we feel in love with the sugar white sand and the emerald clear waters. The conveniences of everything the shopping, restaurants, golf, boating and fishing. Sandpiper Cove Resort is a great place for families to relax and enjoy the many amenities. This is a first floor unit so just walk right in and has a private patio and large backyard to enjoy with friends. Unit is located across the street from the beach. Dinning area seats 6 plus 3 at the counter top. 9 hole par 3 course free for guest.